Friday Night Aftermath: Arcadia pummels Muir, 42-7; Monrovia falls again; Maranatha blows past LC, 41-10; Alhambra suffers first loss in weird-score game, 6-5. Arcadia 42, Muir 7 — Myles Carr completed 14 of 20 passes for 185 yards and touchdown passes to Robby Haines (2), Taylor Lagace and Brian Ponce. Sheldon McKinely left in the second quarter with an ankle injury. There was a scary moment prior to McKinley’s injury when Tairen Owens was knocked out after a tackle on Lagace. Owens appeared to lead with his head and suffered a stinger. He lay motionless for several minutes before her rolled over and eventually slowly walked off the field. Haines also recorded 2.5 sacks, applied relentless pressure on Muir’s Kevon Seymour and Josh Washington. Lagace returned a punt 72 yards and Seymour returned a kickoff 97 yards for the Mustangs’ lone score. Alex McElwee recorded an interception and recovered a Muir fumble, setting up two scoring drives. Muir finished with a meager 35 yards on the ground and no success through the air. Seymour started at quarterback but later gave way to Washington, who also found little to no rhythm. South Hills 34, Monrovia 30— With Vincent Hernandez not able to go with an injured shoulder, Jamel Hart rushed for 155 yards and three touchdowns to lead the Huskies to a come-from-behind victory. Wildcats RB De’Shawn Ramirez had just four carries for -2 yards. South Pasadena 6, Alhambra 5 — Bizarre, I know. At least the score makes it seem that way. The defense was superb for each team, as South Pasadena was limited to two field goals from Dominic Frescura. He kicked a 25-yard field goal with seven seconds left in the second quarter to tie the game 3-3. He squibbed the kickoff, hitting Alhambra before the Tigers recovered. With one second left on the clock, Frescura converted a 30-yard field goal to take a 6-3 lead heading into the half. South Pasadena mishandled a snap that went into the end zone to give the Moors a safety. Alhambra QB Josh Mendoza went 12 of 25 for 139 yards, but his final pass attempt went through the hands of Demeitrias Russell and into the hands of Bryan Bednarski to seal the win for the Tigers. Maranatha 41, La Canada 10 — Maranatha’s Defense hdl La Canada to 22 first-half yards, giving up only 63 on the night. Andrew Elffers completed 16 of 21 passes for 217 yards and three touchdowns and Darien McGee caught two touchdowns, ran for another and returned a kickoff for 100 yards. Beast. Troy French also had three catches for 63 yards. La Canada’s Franklin Cervenka nailed a 36-yard field goal with 5:13 left in the third quarter for the Spartans first points. Kyle Herron’s 3-yard touchdown run with 8:30 left in the game capped the Spartans’ scoring. Burroughs 49, Pasadena 34 — Zander Anding had a killer game with 27 carries for 312 yards and two touchdowns to lead Burroughs. He also returned a kickoff 99 yards for a score. The Indians were leading 28-13 at the half. Pasadena played well, but was playing catch-up the entire game. Brandon Cox carried the Bulldogs the entire game, completing 16 of 23 passes for 300 yards and three touchdowns. He also rushed for 113 yards and two touchdowns on 11 carries. Defense, however, didn’t play to par for the Bulldogs. Too many missed tackles and penalties. South El Monte 41, Temple City 27 — South El Monte scored 27 unanswered points in the fourth quarter to overcome a 13-point deficit after the Rams scored 20 unanswered points in the third quarter. Temple City led 27-14 in the third quarter. Temple City’s Mikal Quintanilla passed for 300 yards and three touchdowns. Anthony Valencia was Quintanilla’s favorite targert with 13 catches for 241 yards and two touchdowns. Rosemead 31, San Gabriel 21 — After a lackluster first-half for Matt Eddy, who had only 34 yards on 15 carries, he woke up and ended up with 35 carries for 183 yards and four touchdowns. San Gabriel’s Andy Guerrero and Alex Villalobos connected for two touchdowns and Guerrero threw for 192 yards. Villalobos recorded 145 yards catching. There were almost 40, COUNT THEM, 40 penalties in the game. Our Guillermo Tovar said he stopped counting after 35 penalties. Bosco Tech 27, La Salle 24 — Bosco Tech mounted a comeback to beat the Lancers in the Del Rey League opener. La Salle squandered an early 14-0 lead in the first quarter. St. Francis 35, West Ranch 0 — St. Francis was lights out. The defense limited West Ranch to just 44 yards on the ground and 64 total yards. West Ranch never passed midfield. Ouch. Keppel 40, Fulton Prep 0 — Fulton Prep forfeited in the fourth quarter because of injuries and lack of players. Esequiel Jimenez had 22 carries for 186 yards and two touchdowns. Tyler Takashita completed 7 of 13 passes for 123 yards and two touchdowns and one on the ground. Nathan May and Julio Tinajero caught both touchdown passes. May also recorded an interception and the Keppel defense held Fulton to 28 total yards. BREAKING NEWS: Muir football coach Ken Howard placed on administrative leave for altercation with a student, Dave Mitchell to coach tonight vs. Arcadia. Football: St. Francis seeks vengeance vs. West Ranch. NBA players confirmed for Sunday’s basketball benefit: Ryan Hollins, Trevor Ariza, Aaron Afflalo, Nick Young , Jarron and Jason Collins and Josh Childress; Also, former UCLA stars Ed’Obannon and Toby Bailey. 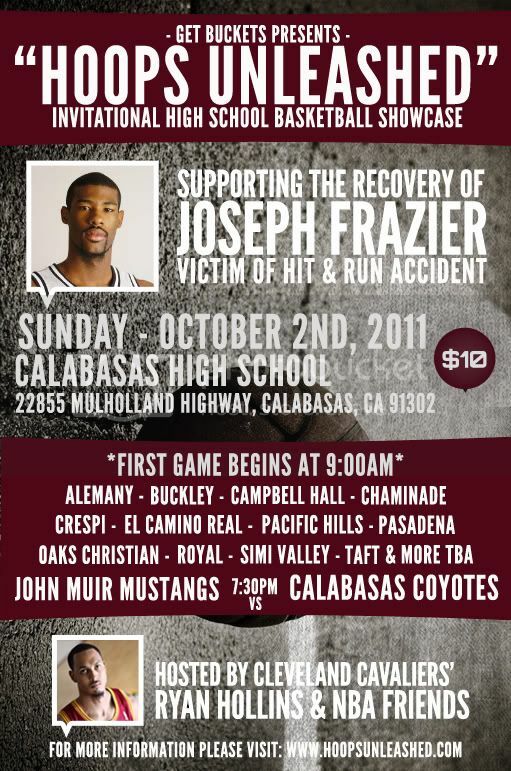 Muir and Pasadena high schools will take part in a basketball charity tournament Sunday at Calabasas High that will benefit former Muir star Joe Frazier, the victim of a recent hit-and-run motorcycle accident who has slipped into a coma. Muir boys basketball coach Gamal Smalley said what started out as a small basketball game between the Mustangs and Calabasas, where Frazier is an assistant boys basketball coach, evolved into an outpouring of support from surrounding communities. The event was spearheaded by former Muir teammate and Cleveland Cavaliers center Ryan Hollins, Calabasas basketball coach Jon Palarz and Muir’s Smalley. Proceeds will go to help Frazier’s medical expenses. Event organizers are asking for $10 donations. The event, initially a one-game showcase, now is an eight-game tournament beginning with Calabasas’ junior varsity team taking on Campbell Hall at 10:45. Pasadena will take on Oaks Christian at 6:15 p.m. followed by the final game of Muir-Calabasas at 7:30. Frazier was a standout at Muir before earning Big West Conference All-Freshman team honors at Cal State Northridge, where he still holds the school record for most steals (10) in a game. The game initially was scheduled to be held at Cal State Northridge where Frazier played for Bobby Braswell, but Smalley said the NCAA did not approve the venue. He also said Braswell stated his players will be at Calabasas on Sunday to support the cause because they were touched and inspired.